It was a bit like that for the Dublin by Night event at Crone on Saturday night: very dark, quite wet and windy, but not too cold. The wind meant that the plumes of steam from your breath didn’t just float up into the beam of your headlight and obscure everything in front, so that was good. A few 3ROC runners went along, with others at the 3-day at Aguiar de Beira in Portugal and at the Edinburgh Big Weekend, despite parts of the city having been embargoed in preparation for the 2022 World Championships sprint races there. See the Crone results and courses here. We had a good laugh when we saw who the controller of the event was listed as – Anna Dorcha (pretty much “Very Dark” in Irish!). 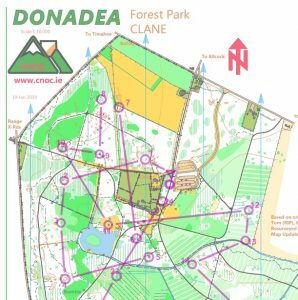 On Sunday, CNOC gave us another chance to run at Donadea, a flat forest in Co. Kildare which has gone through phases of being beautifully runnable, then felled, replanted with young trees and is becoming runnable again, although with areas of bramble. Donadea was actually the scene of possibly the first forest night-O in the country, an event run by 3ROC’s Ronan Cleary and John McCullough in November 1980. 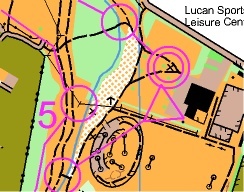 This time, Eileen Loughman’s courses kept us out of the brambles and gave Valdas Tilunas a win on the 8.3 km Long course and John Riordan a second place on the 5.3 km Medium course . See the full results and routes here. This weekend This weekend we have another DBN event at Rockbrook Park School on Saturday, with two more night-O’s to follow on the Curragh and in St Anne’s Park, so keep those headlights charged up. See details here. 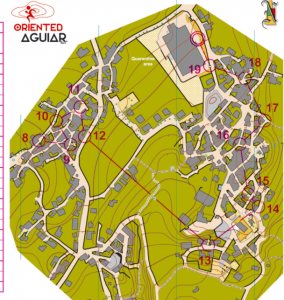 Courses of 1.8 and 3.4 km. Unfortunately there’s no daytime Leinster orienteering until Ballyward on 24th February. Meanwhile, to keep you going, though, there’s an urban event in Clonmel on the 17th, and you can work on your O-techniques with some of the top British orienteers with these excellent short videos produced by the South London club, SLOW. These were brought to our attention by SLOW member, and ex-3ROC, Gordon Parker. See here. Membership Finally, a reminder that you can join 3ROC online here. If you’re new to the sport, we’d love to see you; if you’re an old hand, we’d love to welcome you back! 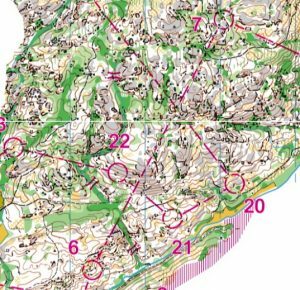 Part of the 12.8 km M21E course from Portugal with times up to almost 4 hours.